I have chased the government to fulfill their commitment to put energy labeling on residential homes at time of sale. That could be extended to commercial buildings (looks like Toronto's going to do this). That would give a strong incentive for home owners, building owners to implement established retrofits that we know work. Good question, Bob! The biggest opportunities are in the energy use of existing buildings. This is where the great untapped potential lies. What conservation opportunities are you most excited about over the next 5 years?
. If we wanted to be aggressive, we could pursue much greater conservation. 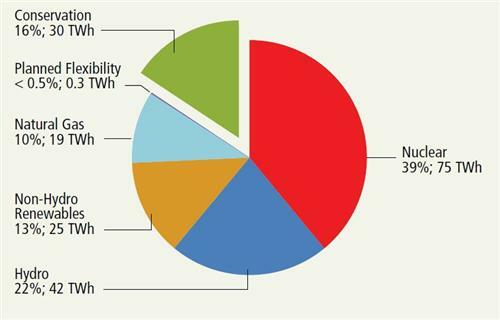 As impressive as the green slice of the pie is, it represents a conservative estimate of the amount of conservation that is actually available. 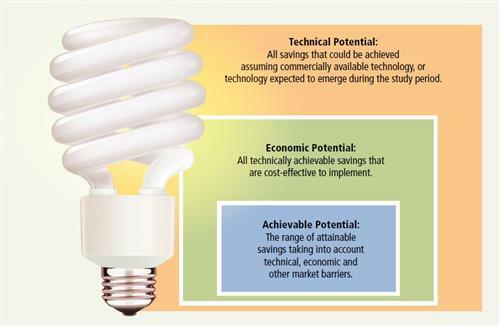 The now IESO does what's called an "Achievable Potential Study"
ECO Staff: How do we know how much energy conservation Ontario can achieve? We would have to build/find 30 TWh of other generation if we did not pursue this conservation. That's a lot of gas plants. Look how big a piece of the pie conservation is. 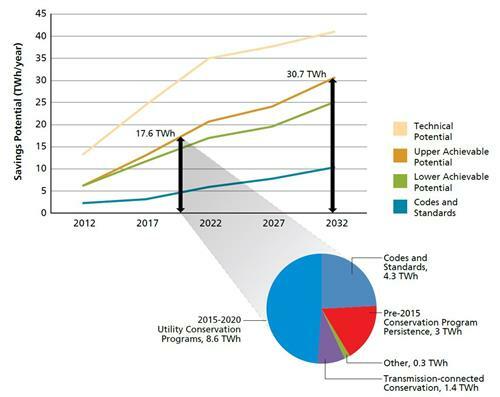 This next graph shows just how big a piece of the pie conservation will provide in servicing our electrical needs of 2032. Here are the cumulative savings from the conservation programs run by the LDCs and the OPA, for the years 2011, 2012, and 2013. 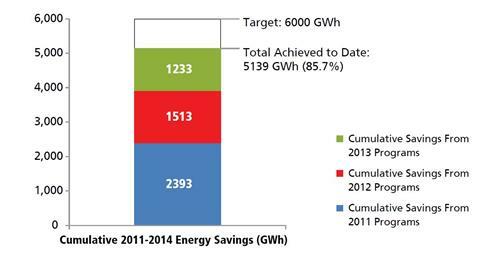 The white part is what we've got left to achieve in 2014 to meet the provincial goal of 6,000 GWh. The data is not confirmed yet, but we just might make it. But going forward for the next 6 years of conservation programs, the targets are much more ambitious. ECO Staff: So how is Ontario doing with energy conservation? Thanks again, Indra. Hopefully that's one of the things that the roving energy managers are trying to address. This could be supported with a special program, as we've done with some industry sectors. But, these are government facilities and we have a government commitment to put conservation first and to develop energy conservation plans for municipalities. Maybe this will spur some action. Certainly, it is an opportunity and the right thing to do. pay back periods to implement energy efficient project in water and waste water is usually more than 6 years and this make the projects less attractive to municipalities. with compliance requirements this sector is very risk adverse and need of sector specific specialist to promote energy conservation will produce more results. With respect to the high on-peak prices, remember that they should be matched with low off-peak prices. So what might be some examples? It would be quite reasonable to have 20 cents per kWh on-peak and 4.7 cents off-peak. This would give a more substantial reward to those people out there who have worked hard to shift their load, while as I've stated before, not affecting the bills of people who just want to do the same thing. ECO Staff: How high should on-peak prices be? Thanks for the question, Peter. On this point we've back slid a bit. We used to have complimentary demand reduction and energy use targets, but going forward for the next 6 years the plan is to only have an energy target with no peak demand target for local distribution companies. This is regrettable. Much is driven by peak demand and we have to constantly focus public attention on that. I hope the peakSaver program doesn't disappear, too. Can energy efficiency and demand reduction programs be better integrated to help meet their respective targets? Indra, you're absolutely right. And there are programs that the sewage and water plants qualify to pay for conservation initiatives through the saveONenergy program. Municipalities also have roving energy managers. But more could probably be done. Most people don't realize that municipalities biggest bill is their electric bill, mostly from their sewage and water plants. Would it be possible to focus conservation in specific and highly regulated sector such as Water and waste water where the potential is enormous. Agencies like OCWA can play crucial role in generating these energy savings. The OEB has not demonstrated much flexibility in the past when dealing with innovative conservation ideas. Good question Eileen. And the answer is: yes, it would be possible. And yes, it would make sense. However, there may be some problems on the billing side - the local distribution companies are challenged presently with the time-of-use information, so there may be some practical problems there. But, the major point is that the rates they are allowed to charge are set by the Ontario Energy Board. Would it be possible (and would it make sense!) at some point to have "sales" on electricity when there is excess capacity? e.g. a windy night, already off-peak, offer even lower prices that people could take advantage of? What we are saying has been misconstrued in the media. I am not asking for people to pay more. If we raise the on-peak price, it is necessary to lower the off-peak price. I posted a blog last year where I ran through an example, where the customer would pay the same bill but we could vary the off-peak and on-peak pricing. It's not about paying more, it's about giving people an incentive, a reward if you like, for shifting their consumption from on-peak to off-peak. ECO Staff: Aren't you aware rates are already too high? People can't afford to pay these extreme prices and now you're asking them to pay more. See, I just don't make this stuff up. So the graph is a plot of 42 international studies where they have had various ratios of on-peak to off-peak pricing. The vertical axis show the reduction of the peak demand as a result. Note that the higher the ratio between peak and off-peak on the x axis, generally the greater the reduction in peak consumption. The greater the difference between off-peak and on-peak, the more likely that people will change when and how they use electricity. This can reduce the need to build more power plants, help the system be more efficient, and reduce costs for customers over the longer term. ECO Staff: We’d like to open our discussion today by looking at electricity conservation through electricity prices, specifically through time-of-use rates. Our office has received lots of feedback on this topic. Time-of-use rates reflect the variable nature of electricity generation costs. The rates were first introduced in 2006 to some customers, and Ontario has since transitioned almost all small volume customers to TOU rates. There are three different electricity price periods in this province (on-peak, mid-peak and off-peak) over two different seasons (May – October, and November – April). You’ve discussed these rates in earlier reports and blogs, where you focused on the on-peak to off-peak price ratio. 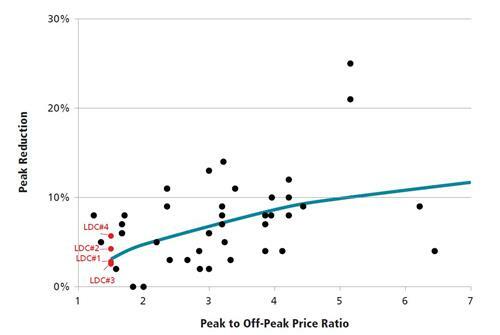 ECO Staff: Why is the on-peak to off-peak price ratio so important? Hello everyone. Welcome and thank you for joining us today. Last week, our office released a report on energy conservation in Ontario. It covered major policy developments from 2013 and 2014, and the results from 2013’s energy conservation programs. You can find a copy on our website – www.eco.on.ca The Environmental Commissioner of Ontario, Gord Miller, will be here shortly to answer any questions that you have about this report. Before we begin, just a quick note to anyone who has already submitted a question through twitter or email (#OntECOLive or Conservation_Report@eco.on.ca). We’ve collected these questions and will try to address them today. However, we may not be able to answer all questions because we only have one hour to discuss each of the topics from the report. Watch the Commissioner's Opening Remarks to the Legislature on the tabling of this report.